Following the huge success of Megahalems comes the super edition, the SUPER MEGA! !It's a hybrid of copper and aluminum for an unmatched level of performance while still keeping it under one kilogram. We have also included an option to install extra pounds of pressure for an even tighter contact between the heatsink base and the CPU. Just when you think air cooling has reached its bottleneck, Prolimatech goes and pulls another one out of the hat. The Mega Trio: First the Megahalems, then the Mega Shadow and now the Super Mega! 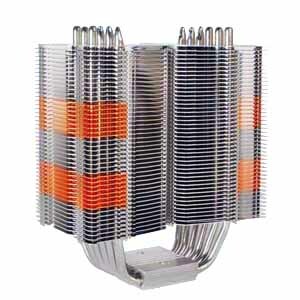 Copper and Aluminum Hybrid for best heat collection and dissipation ratio. Copper fins are strategically positioned for better heat dissipation. Minimal air resistance between fins allowing best balance between noise and performance for fans in the range of 800-1200RPM. For all out performance, fan RPM at 1600 or above is recommended. Vertically adjustable 120/140 mm universal fan clips redesigned for better installation compatibility. The Black screws are included to provide extra pressure for better contact with CPU and heatsink.